← Amex Offer Alert: 10,000 Membership Rewards points with $500+ Virgin Atlantic purchase. You can earn an quick 1,000 Membership Rewards points for purchasing $20 or more from the enrolled AMEX card at one of many local small business that is participating in the program. You can click here to find here. Click the link provided link or go to americanexpress.com/shopsmallmap and find a participating small business. Complete a purchase of $20 or more at the participating small business using the enrolled card associated with the offer. Luckily, my favorite pizza shoppe is on the list and I just figured out what to have for dinner. You can earn even more points when you spend $199 or more at Nest.com. Nest make fantastic home automation and security products including the Nest Thermostat. By completing the transaction with the enrolled card you will earn 4,000 Membership Rewards points. I have been looking a while to upgrade my old mercury thermostat to a new connected thermostat that I can control with my cell phone. No more getting up at 6 in the morning in the bitter cold, to go downstairs and turn up the heat. Nest makes great products and have terrific support, both online and over the phone. 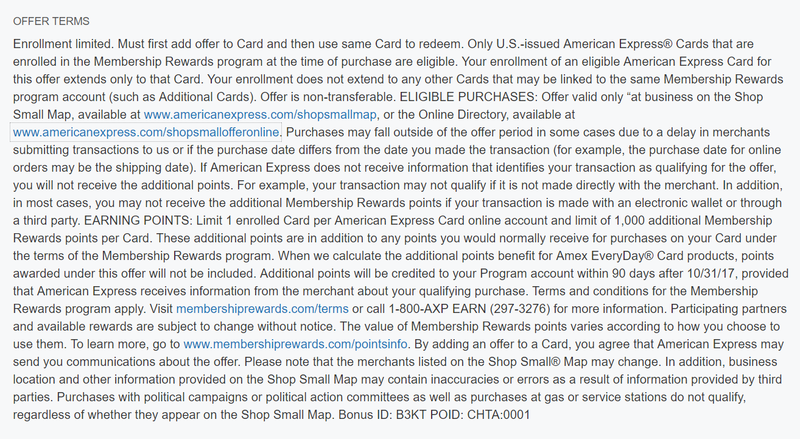 See below for terms and conditions of the AMEX offer.